You can make a garden variety anchor link (<a>) open up a new email. Let's take a little journey into this feature. It's pretty easy to use, but as with anything web, there are lots of things to consider. But we immediately run into a handful of UX issues. One of them is that clicking that link surprises some people in a way they don't like. Sort of the same way clicking on a link to a PDF opens a file instead of a web page. Le sigh. We'll get to that in a bit. "Open in new tab" sometimes does matter. If a user has their default mail client (e.g. Outlook, Apple Mail, etc.) set up to be a native app, it doesn't really matter. 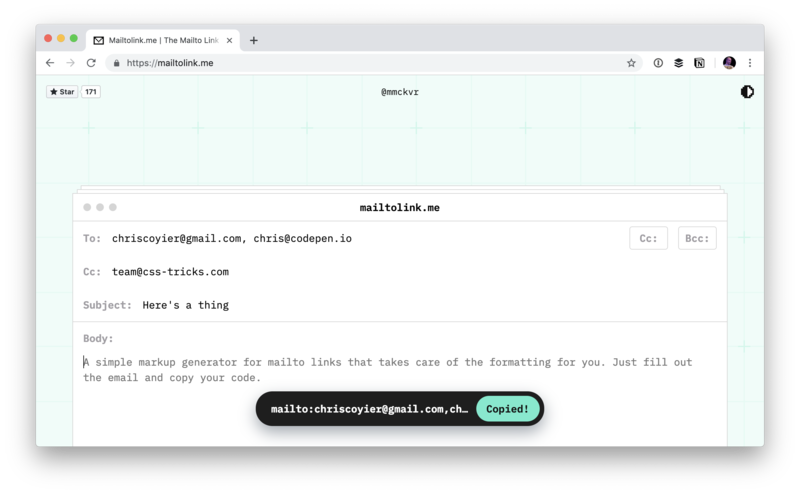 They click a mailto: link, that application opens up, a new email is created, and it behaves the same whether you've attempted to open that link in a new tab or not. But if a user has a browser-based email client set up, it does matter. For example, you can allow Gmail to be your default email handler on Chrome. In that case, the link behaves like any other link, in that if you don't open in a new tab, the page will redirect to Gmail. I'm a little on the fence about it. I've weighed in on opening links in new tabs before, but not specifically about opening emails. I'd say I lean a bit toward using target="_blank" on mail links, despite my feelings on using it in other scenarios. I'm not sure how useful this is, but it's an interesting curiosity that you can make a <form> do a GET, which is basically a redirect to a URL — and that URL can be in the mailto: format with query params populated by the inputs! It can even open in a new tab. I dig how it doesn't just block them, but copies the email address to your clipboard and tells you that's what it did. The body argument can’t contain html, not even if you escape it in any format. (some browser+client might still accept it but it’s not valid). I’d like to know if mailto: links are broken for some users. In other words, can clicking on such a link result in an error state or any state where the user doesn’t see a “New message” dialog as the result of clicking the link? The form with target=”_blank” doesn’t work on (at least) Android Chrome 73, it just opens the URL in a new, empty tab… After removing the target, it does however open the mail app (or app selector if you have multiple)… It does work as expected on a link, so might be just an Android thing (not handling the intent/activity). In Firefox 66 the target=”_blank” (also on the form example) appears to ignored which is a shame. I really like the form to generate the email. Did I miss something. How can we tell which mail client they use? I actually like using mailto; when I have directions for what to ask me for to do something and a list of what to provide, I’ll usually use the email address as the visible link. But if they click it, then it prefills the email with everything in place so they can just fill in the blanks. I hadn’t considered using a GET form before, though; that’s pretty clever! However futuristic front-end gets, always there is room back at the basics department we would have definitely missed. #backtobasics is what we need at times. I actually avoid mailto: over just sending the user to a basic contact form. You would think that the browsers would have made an in-page email client to do a pop-up form that already connects to their email browser. The problem I’ve found with this approach is the times where you want to keep a copy of the message you’re sending. You can manually copy/paste the message somewhere of course but I like to add a ‘Mail me a copy’ checkbox to forms for this reason. Isn’t a mailto link open to bots? It is(to crawlers), but I stopped worrying about that a long time ago. Nowadays spammers can easily buy or find huge lists of verified mail addresses for less money than it would cost to maintain a crawler. Of course there are probably exceptions but the focus for spammers is likely more towards finding mail addresses to send from rather than to. I never had to care about email issues as I always had the option to route through server side cpanel stuff. Now I am using aws s3 buckets for serving up static sites, thus article is very useful. Though the whole process seems archaic. a) “a garden variety anchor link”. What does this mean exactly? b) “If you use an actual email address as the link, that’s probably a good indication”. We can’t use actual email addresses anymore b/c of GDPR. c) “Or you could use CSS to help explain with a little emoji story”. What does this mean exactly? There is no context or visible end result of said coding. “Garden Variety” is another way of saying “common” or “standard.” So, we’re talking about common or standard links in this case. “If you use an actual email address as the link, that’s probably a good indication” is referring to the email address that is used on the link, rather than the email address of the user. There shouldn’t be any GDPR concerns using mailto links in content. An emoji can be added either before or after the link using pseudo selectors to make the link a little more obvious for the user to inform what they’re about to click on, or as a bit of decoration. Ive noticed that mailto: links are no longer working in Safari on iOS 11.3, anybody else come across this? mailto links aside we have had success with PDFs and other docs by clearly labeling them – PDF AND opening them up in Google Drive preview windows in new tabs. From a UX perspective users can simply see the document and/or make a choice from that point to download and print.